Right off the bat, let’s make one thing clear: I don’t pretend to be a martial arts or Asian cinema expert. I’ve seen my share of chop-sockey flicks, both good and bad, but I’m a casual observer at best. 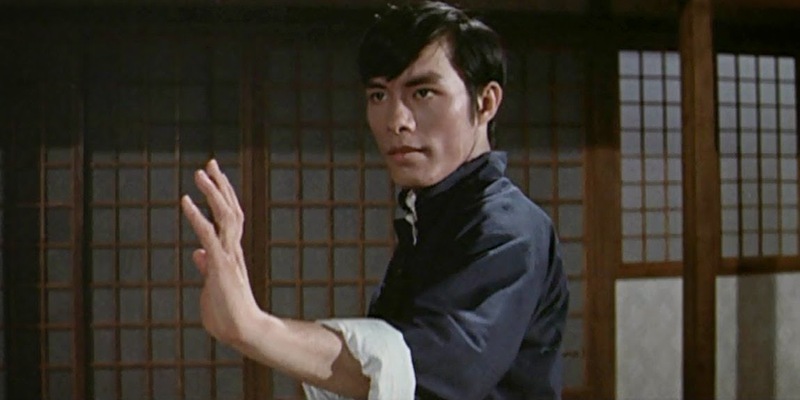 Martial arts-wise, I’ve seen Bruce Lee’s five official features, several of Jackie Chan’s Hong Kong outings, Seven Samurai, 47 Ronin, a few 80s Cannon ninjafests, Five Deadly Venoms and other classic Shaw Brothers offerings, newer stuff like Crouching Tiger Hidden Dragon, the Ong Baks, The Raid and its sequel, and maybe a dozen Jet Li movies. More than some, far less than others, but on the whole I can say I like the genre and am always eager to experience more. Realizing that there are plenty of folks out there who feel the way I do, Shout! Factory has served up a double dose of classic Golden Harvest Studios with the powerful-in-gesture-and-presence Angela Mao (aka Mao Ying) leading the charge. Mao is probably best known to Western viewers as Bruce Lee’s character’s sister in Enter the Dragon (her tragic fate leads directly to his quest upon villainous Han’s island getaway), but these two 1972 films, Lady Whirlwind and Hapkido predate the Lee flick and display clearly how she came to earn her vaunted “guest star” status therein. Hong Kong superstar Sammo Hung (aka Hung Kam-bo) co-stars with Mao in the two offerings, playing both sides of the fence. 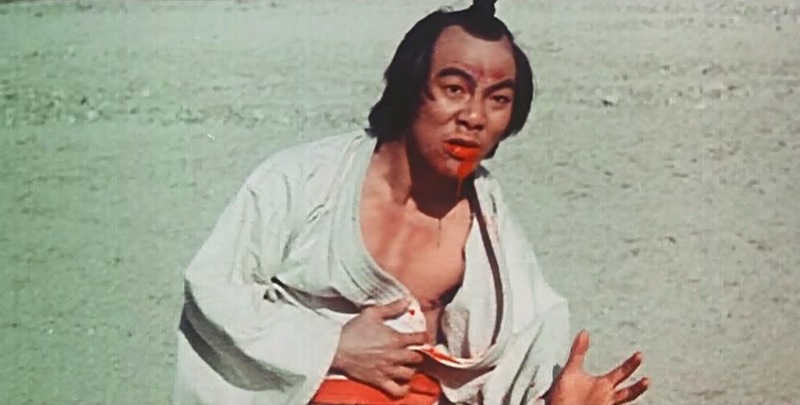 In Hapkido, he shares the spotlight as her hot-headed brother; in Lady Whirlwind, he is the severely put-upon second-in-command of the evil Japanese syndicate terrorizing a small town. Famed for his incredible agility and strength considering his somewhat roly-poly physique, Hung never reached the heights of international fame achieved by fellow Peking Opera graduate Jackie Chan, but the well-versed seemingly often revere the two as equals. Story-wise, there’s not much new ground broken in either movie. Hapkido sees Mao, Hung, and Carter Wong as three Chinese siblings studying the titular Korean style of kung fu (under real-life Grandmaster Han Jae Ji), then returning to their homeland to start their own school. The facility also seems to serve as a part-time medical clinic, by the number of infirm who keep showing up at the door for massage, balms, etc. (in unison) "We wooooon't, Teacher...tee hee hee..."
With no other recourse left, the battle royale must be waged, with Mao ultimately emerging victorious. Chan appears uncredited (and barely recognizable) as one of the Black Bear thugs, along with future star Cory Yuen (another Peking Opera alum). Lady Whirlwind stars Mao as a determined avenging angel, out to destroy the man (Yi Chang) whose jilting of her sister led to suicide three years prior. Complicating matters is the resident Japanese gang, which already tried to murder Chang for being too headstrong and refusing to play ball, is now looking to finish the job. Mao spends the entirety of the film fighting, whether it be with the Japanese that would interfere with her rightful revenge, with the direct object of her rage, or with her conscience as a young fiancée (Ying Bai) begs mercy for her man. Both films showcase each of their lead characters engaging in wildly one-sided brawls, with the many-headed mob – attacking in ones and twos – being leveled time and again, with deliciously over-the-top smacks and cracks accompanying each contact. Thanks for the review, Dr. AC. I happen to agree. In my opinion, Hapkido is undoubtedly the better of the two films. Lady Whirlwind was co-star Sammo Hung's very first solo effort as an Action Director, and - though he had the talents of the young Bruce Leung to draw upon in both films (Bruce later starred as "The Beast" in Kung Fu Hustle) - it does not appear as if any of his fellow Peking Opera trained "brothers" were brought in to serve as support. For Hapkido, however (Sammo's 3rd solo effort as Action Director), he was able to work alongside at least 5 of 6 fellow members of his Peking Opera school's "Seven Little Fortunes" performing troop. In addition to Jackie Chan and Cory Yuen (future director of The Transporter), other identified "Fortunes" include Yuen Miu, Yuen Wah (the leader of the criminal gang in Police Story 3: Supercop) and Sammo & Jackie's closet "brother" - and frequent co-star - the absolutely fabulous Yuen Biao. 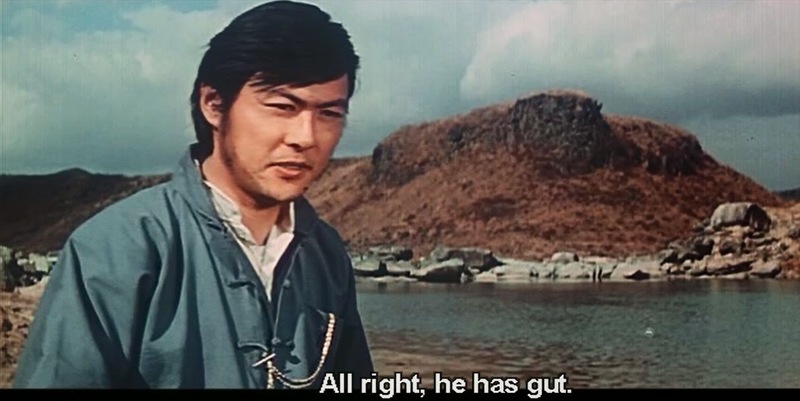 Sammo, of course, would have been intimately familiar with each of his friends special abilities, and thus, could put them to the best possible use. Further, Sammo had the incredible talents of Lam Ching-ying (the future "Mr. Vampire") and Tony Ching Siu-Tong (future director/co-director of the Swordsman and Chinese Ghost Story films) to draw upon. Shout! Factory, as is their established modus operandi, serves up some tasty bonus features on the Hapkido side of the disc with nearly an hour’s worth of interviews with Mao, Hung, Yuen, and Wong (who talks about working with John Carpenter on Big Trouble in Little China and honing Sylvester Stallone’s stick-fighting skills in Rambo III). For Lady Whirlwind, there are trailers for other S!F martial arts offerings, including The Big Boss, The Chinese Connection, Way of the Dragon, Police Story, and others. Both films are available in anamorphic widescreen, with Mandarin 2.0 with English subtitles, although it’s even more amusing to click on the English 2.0 dubbed audio to observe the divergent translations. A couple technical notes: on Hapkido’s English track, there are noticeable dips in volume, almost as if someone was overdubbing the dub, and for both films, the transfer isn’t bad, but don’t expect any crystal clear freeze frames during the action sequences. Remastered versions might be nice in the future, but the films are entertaining enough in their present state, and we’re thankful for their presence on shiny silver disc. 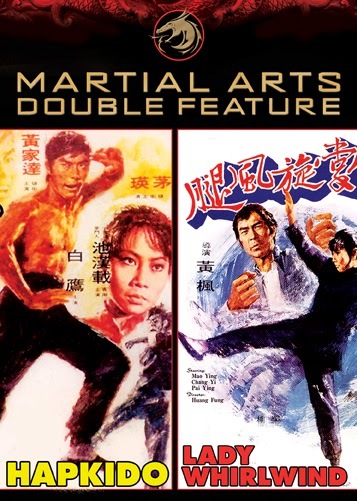 This Martial Arts Double Feature is available now on DVD from Shout! Factory and can be ordered HERE.